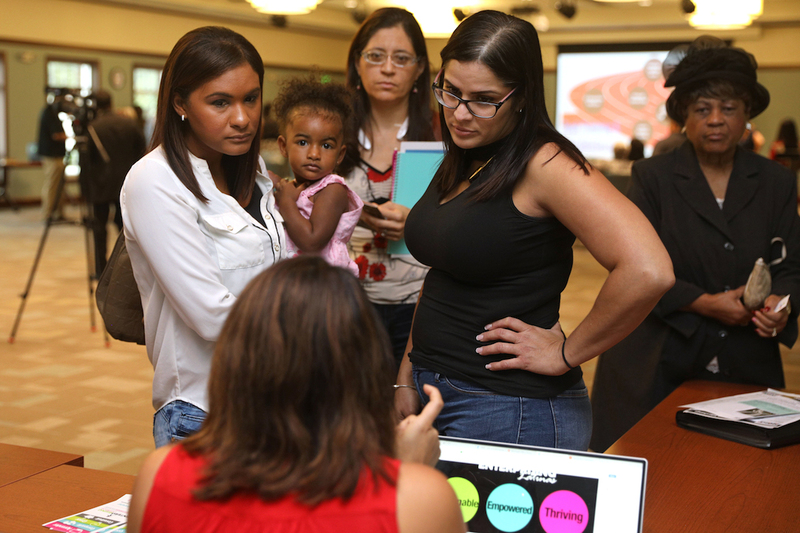 Zuleyka Cedeno holds her daughter, Sofia Ferrer, as she and Keila Correa receive information from Enterprising Latinas Program Manager Sara Arias during the Tech Training and Jobs InfoSession in Tampa, Fla., on Monday, August 28, 2017. Going to a job fair is like speed dating. You dress up, check your teeth for spinach and prepare a quick elevator speech about yourself. Then you head into a crowded hall to meet dozens of potential suitors — er, hiring managers — and hope you stand out from your competition. You only have a few minutes to size each other up before moving on to another booth, and another and another. The next few days are spent sitting by the phone or stalking your email box hoping someone will give you a rose — I mean, call you. Job fairs, also called career fairs, are nerve-wracking, but they can also be an important part of finding your dream job. I asked some business owners, hiring managers and career coaches for tips on winning the career fair lottery and landing a job. Here’s what they had to say. “Whether you’re attending a job fair for the first time or you’ve been many times, it’s important to look and act like a professional,” recommends Deborah Sweeney, CEO for MyCorporation.com. Straighten your tie, smooth your hair and take a deep breath. You’ve got this. “If you’re shy or particularly introverted, bring a ‘career buddy’ — a friend in your field or in your major if you’re still in college and attending career fairs before graduation,” says Valerie Streif, Senior Advisor for thementat.com, an online network for job seekers. “Ask open-ended questions that you couldn’t find the answers to online, like ‘What do you like about working for the company?’ or ‘Where do you see the company going in the next five years?’ suggests Julie Austin, founder of Fun Job Fairs. “Networking at a job fair is exactly what you need to move your career in the right direction. Even if you are not the right fit for a company you inquire about, they may offer you advice on other companies to apply for,” says Steve Pritchard, business consultant for mobile network giffgaff. The fair may be over, but your work isn’t done yet. “Always get the hiring manager’s contact information, and thank them for their time with a follow-up thank you note that sums up your interest,” suggests Laura Platt, human resources director for online retail company Spreadshirt. Now that you know what to expect and what to do at a job fair, it’s time to practice. Type “career fair” and “job fair” into your favorite search engine, followed by the name of your town or city to find out what’s happening nearby. Lisa McGreevy is a staff writer at The Penny Hoarder. The last career fair she went to made her break out in a cold sweat but she survived — and landed a sweet job for her efforts!